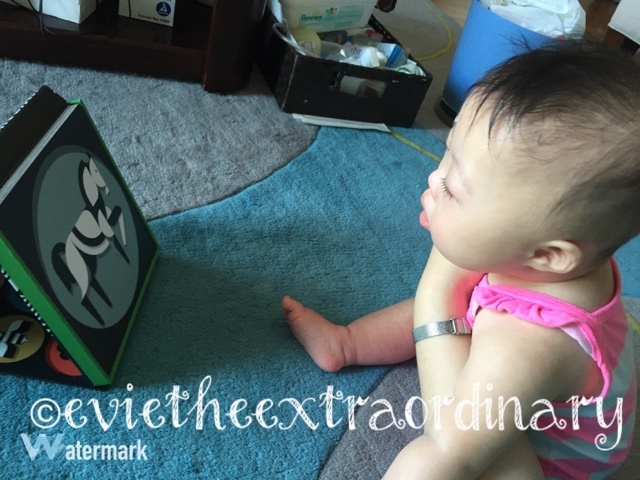 Evie the Extraordinary and Her Mommy: The Journey As We Go: Pop-Up Zoos, High Contrast, and A Giveaway! Evie hates tummy time. Her low muscle tone that comes with Down Syndrome makes it a little harder for her to coordinate pushing herself up. She's getting better at it by the day, but it's still not her favorite to be on her tummy. She yells at the rug until I pick her up. She also does not like to sit still anymore. This can be a problem when she is getting her food through g-tube, and needs to sit for a little more than an hour. Enter my friend Paul Lee's awesome designer baby products, under the brand name Giantsuper. I'm not just telling you about these because he's a friend from way back when, but because Evie actually really likes them. The first product we bought was the Peekaboo Pop-up Zoo. These beautifully designed cards have animals on the front and thoughtful questions to talk about with your child on the back. The best part is that you use your finger to pop up the animal, and then you get to see your baby's face light up. I told Paul that I loved the pop-up zoo, and he sent me another product for Evie, called Tummy Time Playboard. This Playboard unfolds and sits up on its own, with a mirror one one side and a stand for the beautifully-illustrated cards on the other. The cards are 2-sided, with high-contrast animals on one side, and high-contrast designs on the other side. As you can see in the picture, Evie is smiling during tummy time, which is saying quite a lot about this product. The high-contrast artwork is great for visual development, and holds Evie's attention quite well, unless I am taking her picture, and then she wants to look at my phone. There are also Alphabet Cards, but Evie will have to grow into those! 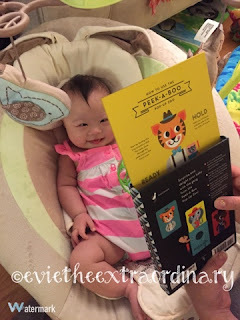 Paul was nice enough to send me an extra Peekaboo Pop-Up Zoo, so I get to do a giveaway! All you have to do is comment below about your favorite animal and why you would like to try a pop-up zoo. Then enter the rafflecopter giveaway below. The giveaway will close on Monday, August 10 at 12 am. Evie says you'll like these! Use the code "peekaboo" for a 40% discount on the Peek-A-Boo Pop-Up Zoo. If you're in the market for high-contrast visuals for your baby, I also like "Hello, Animals!" I bought it for Evie before she was born, and we read it to her in the NICU. This post was brought to you by Evie and her mommy, who shops on Amazon a little too much. A big thank you to Giantsuper for giving me a reason to post! I love giraffes! EmJ is not a big fan of tummy time either! I think it's because of her chubby tummy haha! 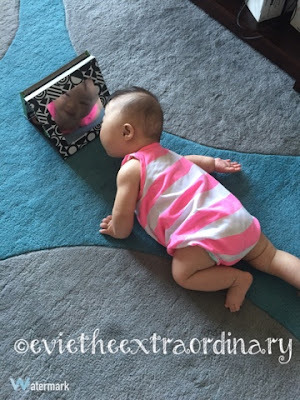 Maybe this product will also help her like tummy time like it has for Evie! Penguins!!! This looks like V and E could enjoy it together. Amelie would love to try it, she loves looking a picture. Her favorite animal is a kitty.